"Great idea having a soft launch. Only problem is the launching site is spectacularly lame! It actually looks like a bad version of Saab site circa 2002. I can't help wishing they took a more interesting route, like Attik did for Scion. Camaro has such a vibrant storied history and personality, to have this bland, poorly achieved minimal mushy mush is such a ridiculously horrible business decision." I think the Camaro site is FANTASTIC! You can play with different colors and options to get a real look at the car. 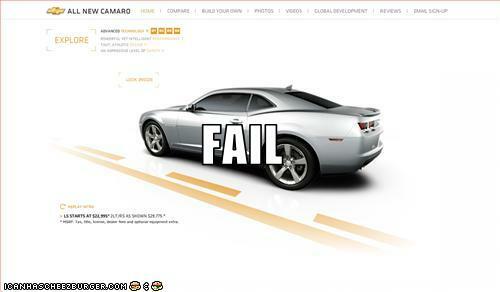 What is not fantastic is the advertisments that say "Fantastic Camaro Deals" and no one has any deals or cars. The wait has been too long. The trouble with GM is it just moves to slow. ie: The SSR, it took 4 years to produce it then it cost 35% higher then origionaly quoted. Holy Cow, hurry up already! Make the Z/28 and the rag top! It's too bad, because the car is very impressive.